On Tuesday, May 26, the Chinese government promulgated the first White Paper in the history of China specifically dedicated to China’s military strategy. The publication of this document became the next step taken by Beijing to demonstrate its measures made serving the purpose of enhancing transparency in military modernization. Beijing is systematically criticized by Western countries due to increasing military spending observed over a number of years, increasing military potential of China, as well as the lack of transparency in development of military capability. The West’s concerns about development of military capability in China are understandable. China’s defence budget has demonstrated continuous and steady growth over many years. 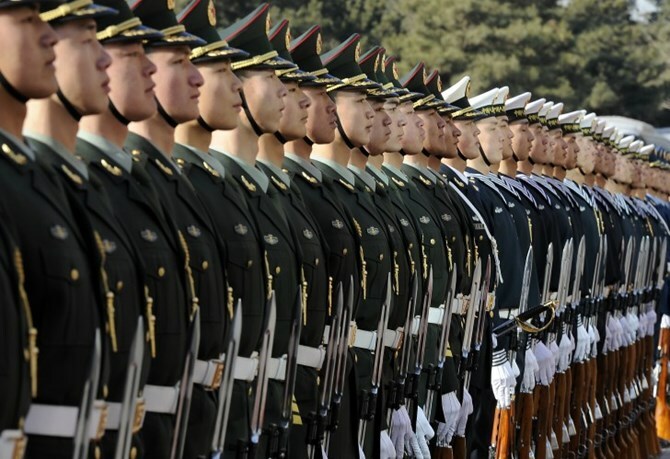 In the period from 2004 to 2013, the annual increase in the official defence budget of China averaged 9.4%. According to Chinese official figures (which, according to Western sources, are greatly underestimated in comparison with the real values), in 2013 it increased by 10.7% compared with the previous year, amounting to 114.3 billion USD. In 2014, defence spending increased by 12.2% compared with the level of 2013, reaching 132 billion USD, and in 2015 it will increase by 10.1% and amount to 142 billion USD. Now China ranks second in the world in defence spending, coming second only to the United States. According to the calculations of Stockholm International Peace Research Institute (SIPRI), China’s share in global defence spending in 2013 was about 11%. Several Western countries, including the United States in particular, constantly focus on China’s increasing defence budget, on strengthening certain components of the military potential of China, questioning the need for such a strengthening and its peaceful orientation. The natural need to strengthen the defence capabilities of a rapidly developing power is often represented as an evidence of a growing “Chinese threat”. Such an approach to China actualizes the need to develop a system of transparency and publicity of various aspects of China’s military policy. The first steps in this direction were taken by the Chinese leadership as early as in the late 1990s, when since 1998 on a regular basis (every two years) the White Papers “China’s National Defence” have been published, which reflected issues such as the assessment of the military and political situation in the world and in the Asia-Pacific region, as well as the basics of the defence policy and development of military capabilities in China. Over time, these White Papers became more and more informative. The White Paper “China’s Military Strategy” released a few days ago was the ninth document in the military field. Since August 2009, in a test mode, and two years later on a formal basis the site of the Defence Ministry of China became operational. On Monday, May 25, 2015 the launch of the official microblog and an account by the Defence Ministry of China using Weibo platform was announced. The reasons that prompted Beijing to make information relating to the military sector more public and accessible was the desire to dispel fears distributed in some countries about the existence of the “China threat”. In this regard, Beijing is constantly emphasizing the peaceful nature of the modernization of its armed forces, the defensive nature of its military policy, its commitment to peaceful development, and the desire to build a “harmonious world”. The White Paper of 2015 has affirmed China’s commitment to its long-voiced strategic concept of “active defence” involving refusal to initiate or participate in wars of aggression, but allowing participation in a war in the event of the need to protect national sovereignty and territorial integrity. The document places particular emphasis on this concept, and three components at the present stage: unity of strategic defence and readiness for a tactical attack; commitment to the strategy of defence, self-defence and counter-attack against the enemy; commitment to the position “We will not attack until we are attacked, but we will certainly give a rebuff in case of attack.” The main focus of preparations for military action has been cited as victory in local wars under conditions of informatization. The White Paper contains a description of the current military and political situation in the world and the Asia-Pacific region. In assessing the international situation, a number of profound historical changes in the balance of forces, the structure of global governance, and the geostrategic landscape of the Asia-Pacific region are noted. It also states the international competition in the economic, scientific, technological and military fields. Among the most serious threats to be noted are hegemonism, position-of-strength policy and neo-interventionalism; intensification of international competition for the redistribution of power; terrorist activities; ethnic, religious, territorial and border disputes; small-scale wars, conflicts and crises. Among the key factors that have a negative impact on security and stability in the so-called “near environment” of China (Asia-Pacific region) listed in the White Paper are the US strategy of “rebalancing toward the Asia-Pacific region”, the military policy of Japan, provocation by some neighbours of China in respect of the disputed islands, interference of external forces in the territorial disputes in the South China Sea (quite clear allusion to Washington), and instability on the Korean peninsula. In the White Paper, Beijing has frankly stated that some riparian countries, China’s neighbours, resort to provocations and strengthen their military presence on reefs and islands owned by China. As early as at the end of April 2015, PRC’s Foreign Ministry Spokesperson Hong Lei accused the Philippines and Vietnam, saying that over the years these states have engaged in creation of artificial islands, large-scale construction of airfields and other facilities, as well as deployment of missiles on disputed islands in the South China Sea. In particular, Beijing accused the Philippines of building on the islands disputed by China an airport, a wharf, and tourism facilities, of strengthening the warship stranded near the Zhenay Reef, and Vietnam of building numerous artificial islands in the vicinity of the Spratly archipelago, as well as of building on the disputed islands runways, helipads, missile installations, administrative buildings, barracks, lighthouses, hotels and other infrastructure facilities. Protecting maritime rights and interests is referred to in the White Paper as a long-term objective of China. - A part of the White Paper, which reveals the intentions of China to develop military cooperation with the world countries, attracts quite much interest. In the first place, its intention to continue military exchanges and cooperation with Russia is stated. And only secondarily, its willingness to develop a new model of military relations with the United States is indicated. It subsequently refers to plans to develop military cooperation with neighbouring countries, its European, African, Latin American and South Pacific partners. In general, the content of the White Paper on military strategy suggests the high importance that the Chinese government places, on the one hand, on military modernization and the creation of a highly effective and strong army, and on the other hand – on clarifying for the international community its motives and the main directions of its development of military capabilities.